. Last edited 16:21 8 Feb 2019. 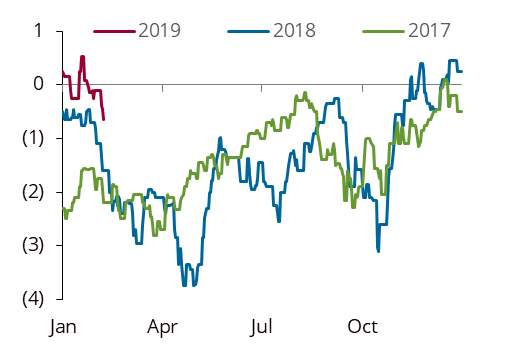 The rally in both crude and equities to start the year has been met by a healthy dose of scepticism for the most part. Any boost from the dovish pivot by the Fed has been short-lived and failed to solidify the rebound in equities. Moreover, risk assets are moving counterintuitively as a consequence. For example, gold and the dollar have a strong inverse relationship historically speaking—when the dollar sells off, gold rallies and vice versa. However, over the last few weeks both have been rallying. Given that the Fed is now signalling easing, the dollar move is perhaps the most curious. But perhaps the market is thinking this could be a race to the bottom by central banks—everyone will be easing along with the Fed, in which case the dollar will remain bid, relatively speaking. The bears have long argued that this most recent uptick in equities has been nothing more than a bear market rally. They got some reinforcement this week with the way equities have traded. Equities also got a jolt this week as Trump poured cold water on hopes of a Trump-Xi summit that would deliver some…well…deliverables. The market is now worried that the trade war is again about to get worse before it gets better. This may help explain why Trump assembled the plunge protection squad earlier this week by meeting with Treasury Secretary Mnuchin, Federal Reserve Chair Powell and Vice Chair Clarida—a highly unusual gathering to say the least. A collapse of the US-China trade negotiations would not be greeted warmly by the market. It is possible that ‘Team Trump’ is simply doing some hard negotiating. We do not expect a total collapse in the talks. 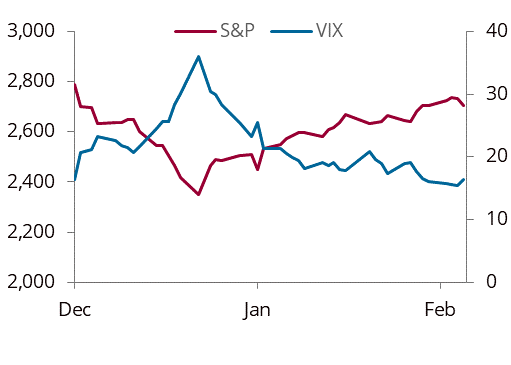 Volatility is again rearing its ugly head, which in the past year has been bad news for risk assets. Crude, while trading closely with equities, has its own dynamic. Many in the oil patch declined to embrace this rally, believing it to be a technically driven dead (or even fatally wounded) cat bounce. 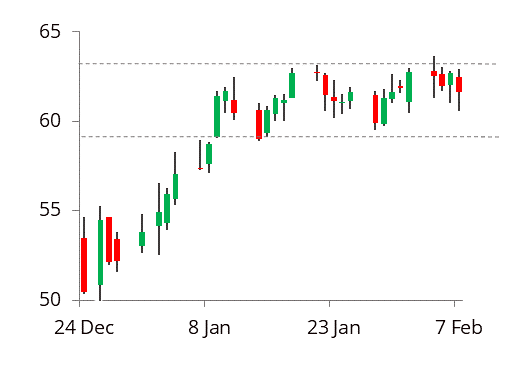 Since popping in the first week of trading in the new year, Brent has traded in a tight $59–63 range despite a steady stream of bullish news from Libya, Venezuela and Saudi Arabia. In Libya, the Sharara outage has kept some 0.3 mb/d of crude off the market, and although the field may seem close to be restarting, there is now a potential fight over control underway between rival Libyan factions (see E-mail alert: Libya's 0.30 mb/d Sharara likely to reopen by March, 6 February 2019). Meanwhile, US sanctions against Venezuela are creating all sorts of sour crude dislocations, propping up physical markets, and the lack of a swift resolution there means there will likely be significant production losses by summer (See our E-mail alert: Deconstructing US sanctions on Venezuela, 4 February 2019 ). Saudi Arabia, meanwhile, has substantially reduced its deliveries to the USGC, bringing exports to the US to just over 0.6 mb/d in the past few weeks, down by 0.4 mb/d from November levels, and current loadings implying even lower volumes (nothing to see here). Despite all this, however, with refinery maintenance dampening crude demand, and a market generally that is still suffering from post-traumatic sell-off disorder (PTSD), it is hard for crude to catch a bid. And yet, despite the indifference from those trading flat price, the physical market is abuzz. Sour grades are being bid aggressively by refiners, at a time when the oil market was meant to be at its weakest. But the dichotomy in sentiment between physical and financial traders is stark. Physical traders see lots of opportunity. But anyone who is trading flat price is struggling to distil all the seemingly conflicting news flow into a clear directional bet on the price of oil. Meanwhile, the global economic backdrop also does not inspire confidence and makes it difficult to get bullish oil when the demand outlook remains cloudy. Gasoline is certainly not inspiring confidence, and LPG prices suggest that the current weakness is more than just a consequence of a supply glut. While it is easy to get caught in a vortex of doom and gloom given the macro backdrop, we would note that we already have a very modest growth outlook for 2019 embedded in our model, as we see oil demand increasing by only 1 mb/d y/y. This was a fairly conservative forecast for us, and it is historically rare for oil demand growth to fall short of 1 mb/d. Thus we are hard pressed, absent complete economic implosion, to mark demand even lower. And the fact remains that our underlying call on crude remains unchanged—given the need to make a lot more diesel by the end of this year, there is not enough conventional crude supply to meet demand, and there is a massive mismatch in terms of crude quality on offer relative to what refiners would like to yield. This is not something that will translate into higher flat prices immediately. If anything, differentials and spreads will have to do a lot of the work. But the set up for H2 19 remains constructive—especially the longer Venezuela remains under sanctions—which is going to exacerbate the problems in the products market in terms of the oversupply of light ends (gasoline and naphtha) and structural tightness in gasoil (even before IMO). Patience, however, is not a virtue that comes easily to commodity traders. As one trader noted to us this week “The market is great, but everyone is still carrying their baggage from last year, which will kill PnL this year”. While all of this means that traders are not ready to get long oil, there is little reason to short it either. With the market neither particularly long nor short, a period of consolidation within the recent ranges may be the path of least resistance for oil until there is greater conviction in one of the conflicting narratives. Did the market run out of oil in September? The reality here is that the quality issues in the crude market are already on the cusp of overwhelming the market. This was most evident to us in late Q3 18, when refiners were forced to lower runs for November because they could not source enough crude back in September. This was despite ‘surging’ US crude production and Saudi Arabia marketing some 8 mb/d in exports in a scramble to try and fill the void left by lost supplies from Iran. OPEC, Russia and the US were only able to increase exports by around 2 mb/d to fill an anticipated 2.7 mb/d hole from Iran. So, in September, refiners decided to cut November runs despite strong margins, because there simply was not enough crude around (many refiners were told in September that their waiver requests had been denied). This shortage and scramble for barrels in September spiked Asian sour crudes, with Oman reaching $90 per barrel in September and Brent of eventually climbing to $86. In fact, it is completely plausible that the Trump administration ultimately blinked on Iran because refiners could not find alternatives. Let that sink in for a moment. There was not enough capacity to meet crude demand, despite Saudi Arabia surging production and destocking. Of course, by the time the administration reversed course on waivers, it was too late for refiners that had already made decisions, having committed to their volumes and lowered runs. And by then the market had rolled over and sentiment had shifted—negative gamma kicked in and prices capitulated over a three-week period in November. But this does not alter the fact that, in September, refiners were unable to source enough crude to make up for the loss of Iranian crude. Moreover, it is unclear whether the Trump administration really understands this nuance. The decision to impose sanctions on Venezuela suggests the answer is no. For all the people who still maintain that shale is going to be the swing producer, recent history suggests otherwise. Back in September, US crude was in the midst of a ‘surge’ in production. By end-September, US crude production was around 0.5 mb/d higher than July, with August production in particular surging m/m. Growth slowed in October before surging by 0.35 mb/d m/m again in November. But interestingly, despite the scramble for crude across Asia, the US didn’t export its excess oil, rather inventories in the US built by roughly 1 mb/d (55 mb) between mid-September and end-November. While crude exports did tick 0.4 mb/d higher between July and November, the vast majority of the additional production piled into inventory. If Asia needed the crude, then why, especially as dock capacity was never in question, was that crude not exported? This is where the grade issues come back into focus. The more we investigate the shale dynamics going forward, the more worrying the trends become. It is becoming abundantly clear to us that the limiting constraints for shale are not going to be US infrastructure (pipeline and export docks etc. ), as those are temporary bottlenecks that price and spreads will fix (if there is a wide enough arb, someone will move to capture it). Rather, the limiting constraint will be demand, that is the ability of refiners to consume more US light tight oil. 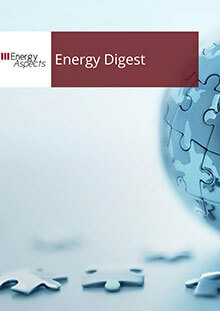 We believe the US is pretty much maxed out on its ability to take more light sweet crude in its refinery system for now. During maintenance, refiners can probably tweak their kits and then return and process a bit more lights each time, but we expect the gains to be small. Meanwhile, we are also seeing some signs of pushback from Europe on incremental US shale. 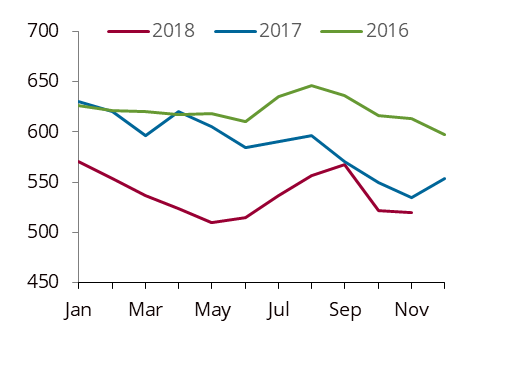 US exports to Europe surged in November and have continued to rise since, and the result has been that gasoline stocks built even as refinery runs crashed lower, which dragged diesel stocks lower (see Light ends Outlook: Cat o’ nine tails, February 2019 ). Some refiners are saying they have had to lower runs because of gasoline storage containment issues with all the light ends yielded by US crude. So that begs the question: how much more can the rest of the world take? This is a difficult question to answer. After all, there is capacity and then there is willingness to run a given slate, and there are always small tweaks that can be made. For example, when the Chinese tariffs on US crude kicked in, South Korea stepped in and bought a big chunk of US crude. 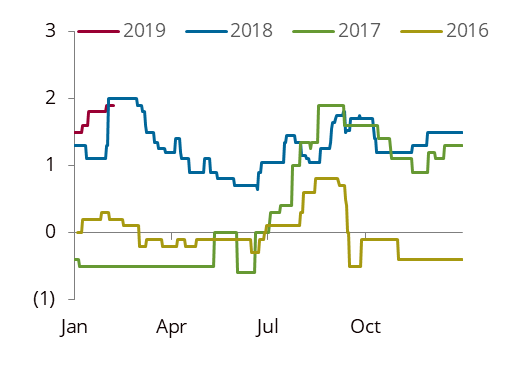 But now, with petchem margins getting crunched in Asia, it is not clear that Korea would be so quick to buy a US barrel with such a strong light end yield. We believe there to be a theoretical capacity in Asia to take about 1 mb/d of incremental US crude. However, whether Asian refiners want to run it is a different story. In September, they chose to lower runs rather than take more US crude. While most in the industry and markets are hyper-focused on the supply growth of shale as the main source of its undoing, not nearly enough attention is being paid to assessing the size of the market that is available for shale oil. And this has huge implications for prices and differentials, not to mention arbs, and of course product prices as well given the imbalance to refinery yields. While US production has grown, distillate yields have been unable to rise. We are starting to see that imbalance manifest itself in the RBOB–HO spread. Even though summer-grade gasoline will get something of a boost from octane, winter-grade gasoline is not going to have any such luxury, and these trends will only be exacerbated over time, especially in a year where the IMO 2020 spec change is dictating that refiners maximise their distillate yield. We still believe that the loss of Venezuelan crude for any prolonged period of time will only serve to exacerbate these issues. Ultimately, the lack of heavy sour barrels will force refiners to seek distillate-rich alternatives as they will no longer have the barrels to blend with lighter crudes. This means West African (WAF) grades are set get more of a bid than has been seen in many years. And if WAF is going to get bid, this will ultimately support Dated Brent as well. This is the pathway for higher oil prices in 2019, but it will take time and will be complicated. 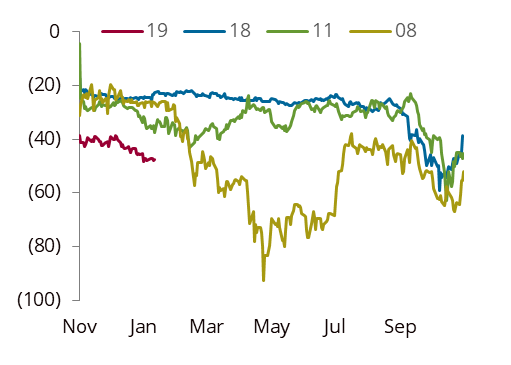 Brent: While Brent flat price sold off, spreads have been firming over the last few days as fundamentals again appear to be defying broader market sentiment. Demand for Forties from Asia has been picking up in February, and the sour market continues to show strength at a time that should have seen weakness. Urals, Mars, and Oman among other sour crudes are all backward. As USGC refiners seek out alternatives for lost Venezuelan production, WAF will become increasingly attractive due to its high distillate cut. 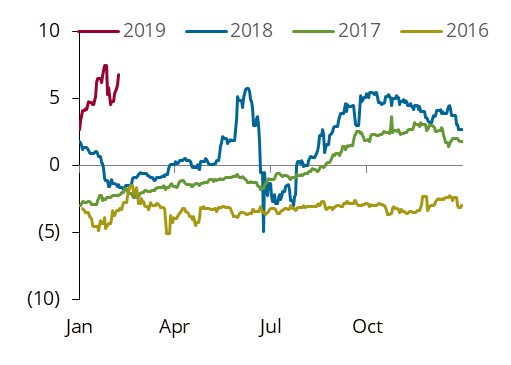 Moreover, USGC refiners are also seeking fuel oil in Europe as coker feedstock, which has pushed simple refining margins higher, in turn supporting light crude demand in Europe. All of this is positive for Brent-based grades. WTI: While flat price volatility has been elevated of late, WTI timespreads have been fairly flat. There is a debate raging within the industry over whether stocks at Cushing will hit tank tops again or not, with some fairly high-profile bets being placed that Cushing will hit tank tops this summer. But there are bullish and bearish factors now driving expectations. Permian pipes are expected to be commissioned sooner than expected, rerouting one important source of supply away from Cushing. However, extreme weather in the Midcon region has shut in a significant amount of refining capacity in PADD 2, which is likely to push crude back into Cushing. But perhaps superseding all that, most recently, TransCanada shut a portion of its 0.59 mb/d Keystone crude pipeline from Steele City, Nebraska, to Patoka, Illinois, to investigate the leak on its right-of-way near St. Louis, Missouri. Enbridge also shut a section of the Platte pipeline in Missouri for the same reason. Enbridge said on Thursday that the Platte line north of Salisbury, Missouri, had returned to service, but anything south of that point remained shut. Just how severe an outage this will be should become clearer in the next few days. But Keystone is reportedly operating its Cushing leg, and if the outage on the Patoka leg is prolonged, this may lead to chunky stockbuilds at Cushing over Q1 19. If, however, supply to Cushing is affected somehow, perhaps if the leak is on the Platte line, then that will be positive for WTI as well. Products: It is starting to feel a lot like 2011: gasoline stocks are surging, diesel is tight, and fuel oil is well bid. Back then, we needed to shut in a significant amount of east coast refining capacity to bring the Atlantic basin products market back into balance. 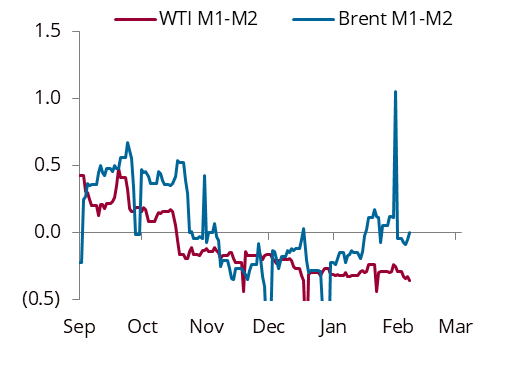 It was only the extreme widening of the WTI-Brent spread that offered a lifeline to East Coast refiners, enabling them to compete due to the cheap crude on offer out of the US Midcon, which gave them an important advantage over competitors in Europe and Asia. But the lifting of the US crude export ban eliminated that advantage. It looks like East Coast refiners are again going to struggle. While FCC and coker economics look challenging on paper, cheap light crude feedstock is still enabling USGC refiners to produce. The crude quality challenges (i.e. too much light, not enough heavy) mean that refiners are going to continue to crank out more gasoline and light ends than they want and not enough distillate to meet demand. This has been the case for the last several years as despite higher and higher refinery runs, the market has needed to draw down distillate stocks in order to meet demand. This is completely disrupting the spread between gasoline and diesel, and while the spread is at seasonal lows, there is no reason to think that it can’t be wider, especially when refiners come out of maintenance. The lower distillate stocks fall in the near term, the tighter the outlook for distillates going forward. This is a structural problem that at the moment looks self-reinforcing—the more light crude cheapens and heavy/medium sour crudes get more expensive, the more refiners will be incentivised to blend in more light crude, lightening the crude slate and more gasoline and naphtha they will yield, exacerbating the tension between gasoline and diesel. At the retail level, there is already a $1 per gallon spread between gasoline and diesel. Could there be a scenario whereby diesel is reaching $4 per gallon at the retail level while gasoline is sub $3? Sure. Is that inflationary or deflationary? Good question. What we do know is that the diesel requirements for IMO will require an outrageous spike in crude runs by Q3 19. If refiners ramp anywhere close to these levels, gasoline is going to be destroyed and will become a by-product. Therefore, we see no limit to the spread. Any form of margin-induced reduction in crude runs is the equivalent of an OPEC cut for the products market.